I was extremely excited when you guys announced that you were spinning paint can lids into resonators (The Hubcap Spun Cigar Box Guitar Resonator) and ordered a large and medium almost immediately. It took a few weeks to figure out which box to use with which resonator. I had the boxes sitting with resonators on top on a table and every now and then would move them around on the box, or swap boxes- Not quite sure what I wanted to do. A few weeks back Del Puckett did a couple videos on using the Fibonacci Sequence/Golden Ratio as a design tool for laying out our boxes. In one of the videos he showed how to make a "golden compass" (which looks like a drafting Compass but with a 3rd leg growing off one side of it) After setting the main legs of the compass on the top and bottom of the box, the "third leg" landed about 2/3rd's of the way down the box- and after putting the center of the resonator on that point I found that I liked the look of the paint can lid n that location. With that as the bridge point I played around with my Gitty Scale Length Templates and decided that a 23" scale looked and felt right with that box. A couple years ago when I started building CBGs I found a 1980's reproduction of an antique desk top cathedral radio. It had an RCA Aux input in the back to hook up a cd player. I moved the Aux in to the side and changed it to a 1/4" jack and use that as both a guitar amp and computer speaker, and it sits next to my couch and computer. Looking at it one day I realized that the little lit area with the radio dial was approximately in the same location as where the bridge fell on my gitty- 2/3rds of the way down with the really cool looking speaker grill dramatically filling the upper space. So I decided to go big and attempt to recreate the same sort of thing as the soundholes on my gitty. I found a straight on shot of my radio online and using photoshop erased away everything but the speaker pattern and sized it for my box and printed it out. I cut out the pieces and laid them on the box. Unfortunately the 2 "comma" shaped holes just didn't seem to work with the circle shape of the resonator so I went with the middle three and hand drew a shape that looked good instead and made two of those, kind of like the Star Trek Federation symbol. I glued everything down and carefully cut all those holes on the lid of box, expecting to ruin it totally. And surprisingly managed not too. I wasn't sure what I was going to use as grill material for the soundholes. I was actually thinking of using window screen mesh. I stopped into this non-profit art materials place where people donate industrial scrap and material for artists and art teachers to purchase grocery bags full of whatever we can fill them with. They have a huge room of nothing but donated cloth that since I don't sew I never venture into. I went in and was surprised to find 5 or 6 different pieces of vintage speaker cloth in various colors and patterns. Including one that was a near perfect match to my radio. I wasn't sure if I wanted to go with that pattern so I took a picture of each cloth with the wood frame on top of it and posted them on all the Facebook pages I normally share the gitty gang show on and asked folks to vote. Almost overwhelmingly the votes were for the cloth that was nearly identical to my radio. 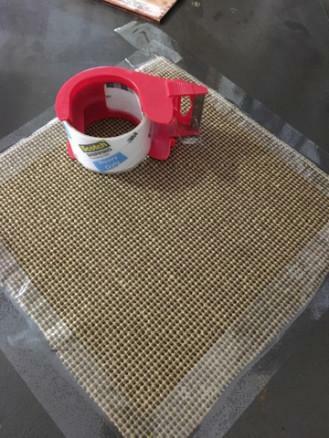 On one of the facebook pages John Mcnair of Red Dog guitars suggested that I reinforce the speaker cloth to keep it from blowing off, so I glued some of the window screen I originally thought of using before finding the cloth. I decided to go with the Teisco Gold Foil pickup first because of one of Shane Speal's videos demoing it- I liked the sound of it. And I thought the wings would be perfect to span the soundholes and allow me to mount in on the box lid itself. After that everything else seemed to fall into place- almost like it built itself. Ideas just seemed to come to me for parts- My tailpiece is one of the hinges I pulled off of a beat up 1940's or 50's typing stand I found in my alley. The volume knob is the lid from a bottle of Bay Rum aftershave that I painted to look like the brown simulated bakelite knobs of the radio. I was led to add some plywood to the top of the box to give it more of a "cathedral look" of my radio, with the different levels of recesses. And finally the last piece of the "pie" was to carry the soundhole theme up to the headstock. 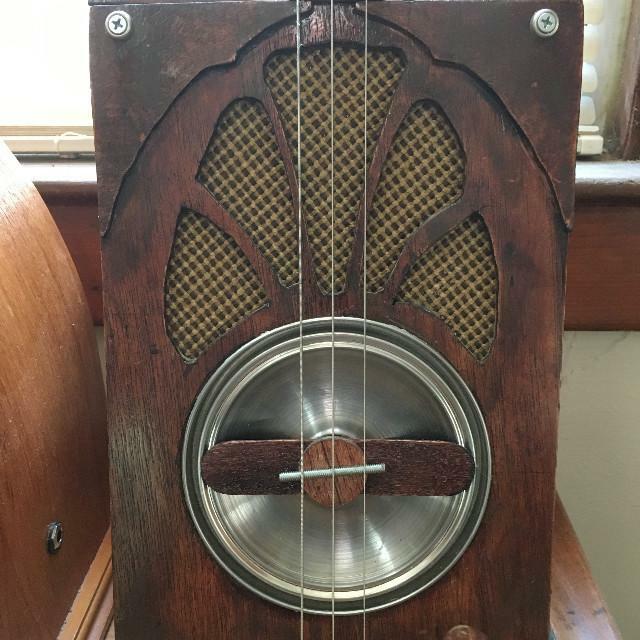 It was a little tricky but I played around with the picture of the soundholes on the original radio and came up with a "butterfly" shape which I got to incorporate "commas" of the original radio. I made the soundholes into a "butterfly" shape, printed it out, glued it onto a piece of 1/8th inch plywood and carefully cut it out. I glued a scrap of speaker grill cloth onto it and glued that to the headstock. I think it adds to the guitar. And the guitar sound beautiful both acoustically (which I was worried about with the relatively thick cloth over the soundholes) and with the gold foil pickup. I have two more larger boxes I found them both at resale shops holding paint and pastel supplies that I'm going to use the large size resonators with- and planning to carry the radio theme onto both of them. One similar to this- with the cathedral radio style, and one I'm thinking with more of a 1950's retro sci-fi radio look to it.